Platinum Proof Coins Resumed, Prices Outrageous… What Was the Mint Thinking? The United States Mint resumed sales of 2008 American Eagle Platinum Proof coins Thursday and the new prices are mind-blowing. One coin’s premium is marked up a whopping 63%. The popular one-ounce platinum coin is $796 higher than yesterday’s platinum price. What was the Mint thinking? 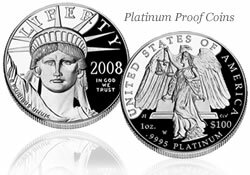 The 2008 platinum collector coins come in bullion sizes of one ounce, one-half ounce, one-quarter ounce and one-tenth ounce. There is also a four-coin set available that includes each coin size. The Mint temporarily suspended sales of the proof versions in late June “due to the increasing market value of platinum.” They were expecting prices to go even higher. At that time, an ounce of platinum (New York) was around $2,070. Yesterday, when coin sales resumed, an ounce was actually LOWER and closed at $1,713.80. In fact, platinum prices are now lower than when 2008 proof platinum coins first went on sale! Yet, the Mint raises prices? In defense of the Mint, bullion prices have been volatile. Plus, the day they set a price is not likely the day those prices become public. But the Mint does have control over when to resume coin sales. Just like they quickly pull the plug with increasing bullion prices, they can do the same on the other side of the equation when premiums are out of whack. And for the latest re-launch yesterday, is that not the case? It’s most irritating that the old and new premiums are nowhere close to each other. Talk about inflation! *Closing price of platinum the day the Mint resumed 2008 proof platinum coin sales. *Price of platinum when the 2008 proof platinum coins first went on sale. Is the Mint forecasting a new upswing for platinum prices? Have they changed their policy and plan to increase bullion coin premiums? Or, are they just not paying attention to the market or their customers? I’m pretty sure it comes from not watching the prices carefully. Since I like to get a 1/10th ounce each year I was hoping for less expensive coins and am certainly not going to pay this much for one unless platinum goes way up. But I have no inside knowledge. If they lower them, I’d probably buy one right away. Why can’t the mint adjust prices on a weekly basis for gold and platinum? Why should one gold first spouse coin be $100 less than another? Why would anyone buy some of these with such huge markups. Doesn’t the mint want to sell out of what they have made? I for one have cut way back on buying from the mint until their prices are more in line with what they should be. Other places that sell bullion can change their prices almost in real time, it’s time for a change.